Is your Samsung Galaxy S7 Stuck at Google Account Verification lock? 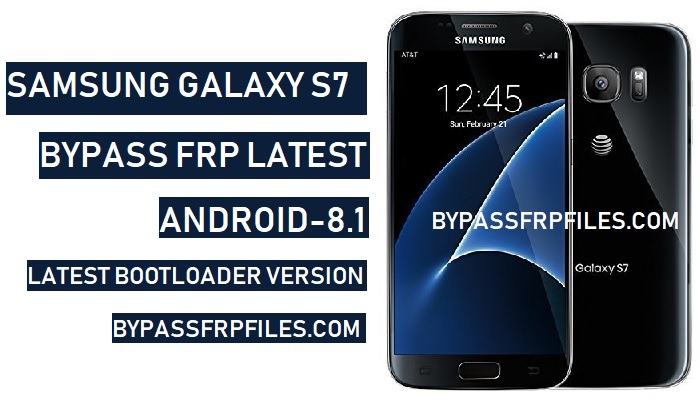 then you need to Bypass FRP Samsung Galaxy S7 Android 8.1, So here we share with you the latest method to Bypass Google Account Samsung Galaxy S7 -Android-8.1, Only you need to download Combination file and Stock firmware, Odin and FRP remove tool, so without wasting any time follow this to guide to Bypass FRP Samsung Galaxy S7-Android 8.1 fully. Make Sure:- This method is only for device owner not for theif person. Note:- This method we successfully tried on Samsung SM-G930A FRP, But you can try this method on other Samsung S7 devices as well, SM-G930V FRP, SM-G930VC FRP, SM-G930T FRP, SM-G930A FRP, SM-G930P FRP. Samsung has updated their security level, Samsung fixed all the security bypass process that help us to Bypass FRP, so we working on new method find a best solution to Bypass FRP Samsung Galaxy S7-Android 8.1 easily. -After that, Press and hold the (Volume Down and Home and Power) key together, until you see Android logo appear on your device screen. -After that, press (Volume UP and Power) key same times once to Bypass SM-G930V FRP. -Then there you will see your device firmware version (G930AXXU8ARZ1). -Now download the same bootloader version Firmware and stock Firmware from below to Bypass FRP Samsung Galaxy S7. -First of all, follow this step to download Stock firmware for your Samsung S7. -We want to Download latest stock firmware so that’s why we want to share with a website “Sammobile.com”, because we need latest version of Stock firmware to Bypass Google Account Samsung Galaxy S7-Android-8.1 (SM-G930A FRP). -After the sign in process is complete then choose “free account”. -Once done, Then go to”Firmware” tab and put your device model name and then download latest stock firmware according to your device country and version. -After that, Now follow the below process to Bypass FRP Samsung Galaxy S7 (SM-G930A FRP) easily. -First download S7 Combination file on your PC, and also download the latest “Odin” tool. -Then extract the S7 Combination file. -Now hit the “START” button on the Odin tool to Bypass Google Account Samsung Galaxy S7-Android-8.1. -Once done, then connect your S7 to PC. -then press any to Bypass FRP Samsung Galaxy S7. -Done, Now we need to flash the Stock firmware to successfully Bypass Google Account Samsung Galaxy S7. -Now extract the Samsung Galaxy S7 Stock Firmware. -Then choose the Stock firmware file to successfully Bypass Google Account Samsung Galaxy S7. -Now put your device again on Download Mode to Bypass FRP Samsung Galaxy S7 successfully. -Done, you have successfully G930A FRP, SM-G930V FRP, SM-G930VC FRP, SM-G930T FRP, SM-G930A FRP, SM-G930P FRP. Thanks for visiting us, Comment below if you face any problem With Bypass FRP Samsung Galaxy S7-Android 8.1| Bypass Google Account Samsung Galaxy S7, we will try to solve your problem as soon as possible. I have a 930V model and the OEM UnLock is not in the options and running the script does nothing in the phone. restart your device then-> on the factory binary screen, – tap on the “Dial” option, -> then press there “*#0808# then -> then you will see USB settings -> there select -> DM+ACM+ADB and tap OK, then wait for restarting your device, once restarted connect USB cable, Now ADB will enabled, run the FRP tool now, then check your phone and tap on “OK” on your device screen, now close and reopen the “ADB FRP tool” follow the same process……. Why is there an error in your screenshot?